It’s rather interesting having a camera that records your every action. Some people seem to be under the impression that helmet cam riders get into more conflicts or seek out chances to put themselves in danger. I actually think it’s quite the opposite. Since getting my camera I’m thinking more about my actions, it’s all well and good saying or even thinking I’m a good cyclist but I now can back that up or disprove it with the video. My wife has so far refused to watch any of my recordings. I think we sat down and watched some parts of the very first recordings I did with the Contour but this was mainly out of her interest in wanting to see the quality of the captured footage. She has heard and read the tales of my exploits in The Game and knows I can be a little bit of a daredevil! This isn’t helped by the wide angle of the camera making some of the gaps I filter into appear a lot narrower then they actually are in real life, again this is great for reflecting on your riding as I have thought a few times “Bloody hell that was tight!”. The attentive among you may also be wondering what the second gadget was? Well spotted! This one is yet another camera, a Muvi-clone that I’m hoping to get properly mounted to the rear of the bike. I’m currently on the 2nd iteration of the mount but it’s not too stable and the captured video is useless unless I’m sat at lights! I have plans to make a sturdier mount but other little projects around the house keep getting in the way so for the time being it’s only forward facing footage! So here we are, almost a year after I setup this blog to track my efforts to complete a century ride all I have to show is less then a dozen posts! I don’t think however I can quite measure 2010 in blog posts though as not only did I successfully complete the original goal of completing the Magnificat I had some fairly significant non-cycling related things happen. For starters we had our 6th child this year!! In what I can only really describe as one of the most beautiful things I’ve ever witnessed my wonderful wife birthed her in a birth pool in the living room without any help! It was recorded as a delivery before arrival as she arrived before any medical help, it all happened so quickly that I don’t honestly think we could have gotten anyone in quick enough to help but that’s a whole other post! So where does this leave me for 2011? Well one thing that doing the Magnificat showed me last year, asides from the fact that I can ride my bike effectively from London to Bristol in a single day, is that I rather enjoyed the “working towards a goal” part. As the previous posts will testify I felt a great sense of achievement as I started pushing my previous personal bests on the fortnightly Sunday rides I was completing. It didn’t matter if it was lapping Richmond Park or the 80 mile jaunt that I went on and somehow managed to a) miss Box Hill and b) not get lost in doing so! So for this year I’ve set myself a rather different target, instead of riding more miles I want to ride on fewer wheels! 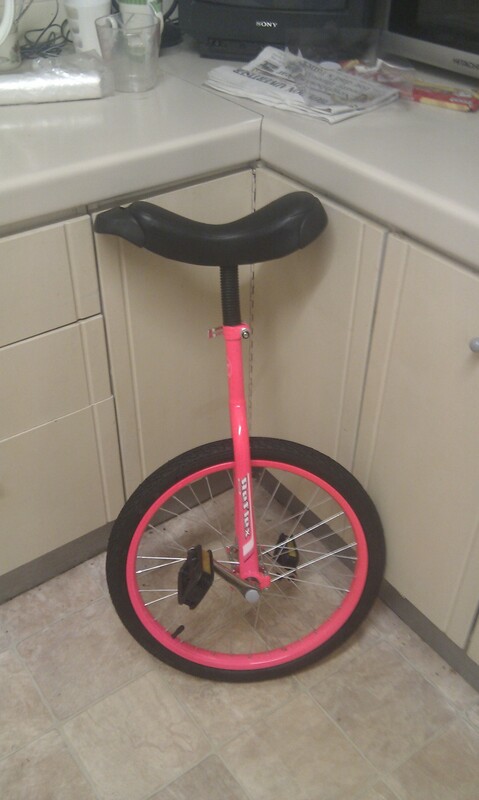 Now I don’t mean something “simple” like learning how to pop a wheelie I mean a proper single wheeled ride – a unicycle! This was partly prompted by a local LBS having a sale on and finding I could purchase one for 40 notes! That was the only colour they had left! I was also rather fortunate that for Christmas Santa brought me some more bike tech! I’ll probably do a blog post for this itself put in summary I’m now the increasing collection of cyclist who record their journeys as I’m now the proud owner of a ContourHD and a MiniDV Muvi-clone camera. I’m still waiting on the helmet mount for the Countour but do have some footage from the MiniDV but will save that for it’s own post. So it looks like 2011 is going to be a fun one for me, must be at least 20-25 years since I first learnt to ride a bike and I decide to go and try and learn again!